One of the most common faults students display is not loading their weight over their back leg when taking the club back. Perhaps because they have been told for years to "keep their head down," most golfers don't make a good enough move off the ball to get in a power position. Try throwing a ball with your back against a wall. Then throw a ball standing away from the wall. Note that there is no comparison, when your back is against the wall you have no leverage and can only throw the ball a short distance, no matter how strong or flexible you are. Yet standing away from the wall you can load up on your back leg by leaning away from the target and then generate a greater amount of force once you step into the throw. Swinging a golf club is no different. In order to maximize your power you must load up your back leg by turning and moving off the ball during your back swing. If done correctly, your upper spine will be tilted away from the target and you'll create additional energy by letting the momentum build. After all, this is what centrifugal force is based upon. We build up the energy then gradually release it starting at the core and increasing the speed outwards as it nears the target. So the next time you want to hit it big think of a throwing motion. Load up your back leg to create some leverage then plant your forward foot creating a brace with your forward leg that you can swing against. 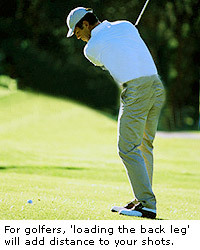 Once the brace is established drive the lower body into the shot as the arms swing the shaft through impact. Remember, an outfielder can't throw a runner out if he doesn't first load up his back leg. Just as true, a golfer can't hit a long shot without creating the same sort of leverage during the swing motion. Walsh is a past champion of the Southwest Chapter, North Florida Section and two-time recipient of the Bill Strausbaugh Award. From 1993 through 2000 he played in the Callaway-Pebble Beach Invitational, featuring a limited number of invited Club Professionals, PGA Tour Professionals, Champion Tour Professionals and LPGA members. Past champions include Johnny Miller, Kirk Triplett, Jim Furyk and Robert Gamez.